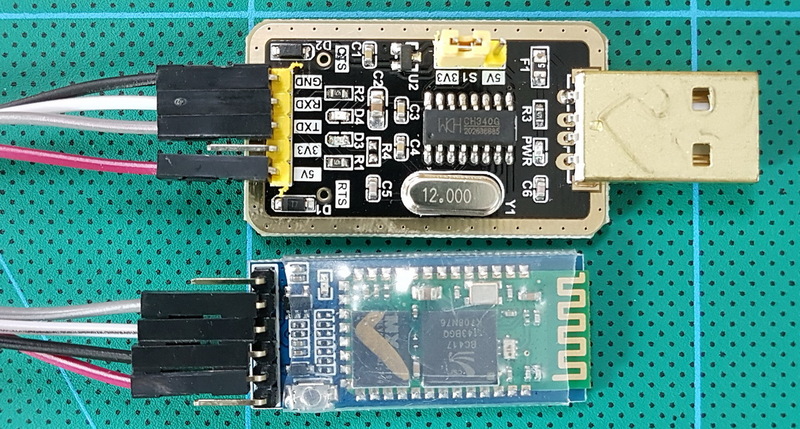 There are now many cheap and no brand HC-05 modules that use the 2.0-20100601 firmware and rather than keep making the same post for different modules I will have a single main post which, as I update and add to it, will become a single point of reference. The 2.0-20100601 firmware is originally by HC/Wavesen and as the version number may suggest it is from 2010. I am not sure if other manufacturers use it under license or simply copy it since the genuine HC/Wavesen modules now use version 2.1 firmware. 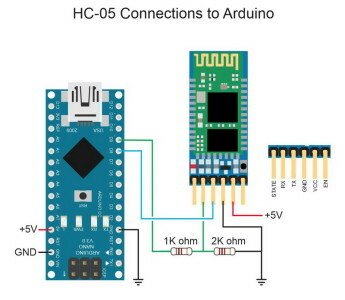 HC-05s are Bluetooth 2 EDR devices that have a serial UART layer on top of the Bluetooth. The UART layer makes them easy to use but hides the Bluetooth functions from the user. This makes then easy to use with microprocessors like Arduinos, especially if all you want is to let 2 things talk to each other. The HC-05 can operate as either a slave or master device. Slave devices cannot initiate connections, they can only accept them. If you want to form a connection with a mobile device such as an Android phone, the phone will be the master device and so the HC-05 will need to be the slave. Master devices can initiate and control connections. If you want to link two HC-05s, one will need to be a master and the other one a slave. When using with a HC-06, the HC-06 will be the slave (HC-06s are slave only). The HC-05 has two modes of operation; AT command mode and communication mode. 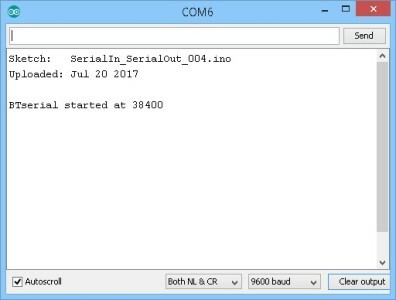 When in AT command mode the device accepts commands and all data received over the serial UART connection is treated as a command. When in communication mode, all data received over the serial UART connection is treated as data and sent to the connected device. If HC-05 is in communication mode but not connected to another device the data disappears in to some mysterious void. AT command mode allows you to control the module, check the modules settings, and change the settings; things like the name, the baud rate, whether or not it operates in slave mode or master mode, to make a connection, and whether or not it auto connects on start. A full mode at 38400 baud. A partial mode at 38400 baud. A partial mode at the user settable baud rate. A partial mini mode (even less commands work) at the user settable baud rate. The majority of commands work when in any AT command mode but there are some key commands that only work in the full AT command mode. This fooled me for quite a while. I now believe the partial/mini AT command mode is a bug in the firmware and so I now only recommend using the full 38400 baud rate AT command mode. – Close the push button switch and power on the module. To enter full AT command mode, pin 34 has to be HIGH all the time. – when you see the LED come on, release the button switch. Please remember, this puts the module in to a “mini” AT command mode and not all commands work. For AT command mode to be fully operational pin 34 should be kept HIGH but this is not possible when using just the push button switch. Therefore, some commands need you to close the switch before sending. To put the module in communication mode simply cycle the power without closing the button switch. – power on the module. This puts the HC-05 in to full AT command mode and all commands should work. 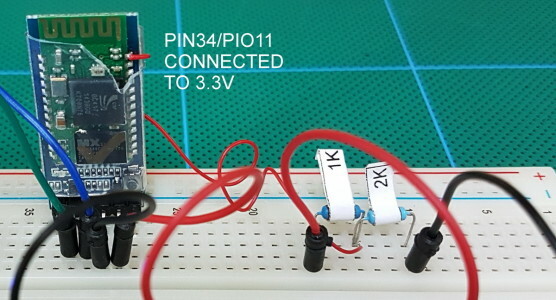 To return to communication mode, remove the +3.3v from pin 34 and cycle the power. If you are doing a lot of work in AT command mode you could solder a wire directly to pin 34 and connect to +3.3v. When in AT command mode the LED flash rate will change to 1 second on, 1 second off (or maybe a little slower). You can also enter a mini AT command mode by pressing the button switch after the module is powered but since many commands do not work I believe this is a bug in the firmware and no longer recommend this method. 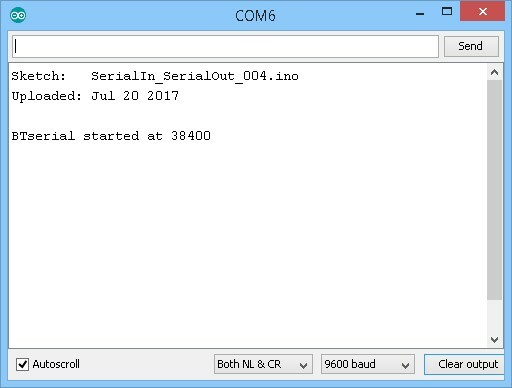 To use AT commands we need to communicate with the HC-05 over the serial UART channel. 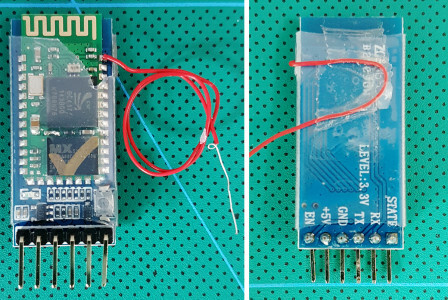 There are 2 main ways of doing this; with a USB to serial UART adapter, or an Arduino and a serial in – serial out sketch. If using a serial UART adapter simply connect and open the Arduino serial monitor. Be aware that the main window will only display the replies from the HC-05. The HC-05 RX pin is 3.3v not 5V. The adapter here has a jumper to select the voltage. If your adapter is 5V only you will need to bring the adapters 5v TX line down to 3.3v before connecting to the HC-05s 3.3v RX pin. For the examples below I am using an Arduino and a serial sketch. Using this setup allows me to echo the commands to the serial monitor so we can clearly see what is happening. For convenience I have soldered a wire directly to pin 34. There is no need to do this unless you are using AT command mode a lot. If you just want to set up the HC-05 once or twice use the push button switch. The voltage divider converts 5V to 3.3v. To control the pin status I use the main vcc lead to the voltage divider. To set pin34 to ground I simply remove the lead from 5v. To check that everything is wired up correctly we can use the “AT” command. This simply returns an “OK”. Make the circuit, connect to the Arduino. The LED on the HC-05 should be blinking quickly about 5 times a second. When the HC-05 is in AT command mode the LED will change to slow blink, 2 seconds on, 2 seconds off. – when you see the LED come on release the button switch. Make sure “Both NL &CR” is selected and the baud rate is set to 9600. Note that there are 2 different baud rates being used; 9600 for the serial monitor, and 38400 for the HC-05. To see if we have everything connected correctly, enter “AT” and you should get an “OK” reply. The 2.0-20100601 firmware has a fairly long list of commands. Some perform common functions and others you may never need. Here are some of the more useful/common commands. Remember that some commands need pin 34 to be HIGH. I have tried to highlight this but may have missed some. If you are using the button switch and do not get a reply, try closing the switch and send the command again (while keeping the switch closed). AT+VERSION? Get the firmware ID/version number. AT+ORGL Resets the module to the factory default settings. AT+RESET Restarts the module. Some times required for changes to take place. AT+NAME? Get the device name. Requires pin 34 to be HIGH. If the pin is not HIGH the HC-05 will not reply. Returns the device name such as “+NAME:H-C-2010-06-01″. AT+NAME=newName Change the modules name to newName. Returns an “OK” if successful. AT+ADDR? Query the module mac address. Returns a hex value in the form “+ADDR:1234:12:123456″. AT+UART? Query the baud rate used for UART serial communication. This is the speed a host device like an Arduino uses to talk to the BT module. It is not the the speed used to send wireless signals between different modules. AT+UART=baudRate,stop,parity Set the baud rate used for serial UART commincation. parity is the parity but. Either 0, 1, or 2. AT+STATE? Query the current device state. AT+ROLE? Query the current role. Returns 0,1, or 2. 2 = slave echo mode. AT+ROLE=x Set the module mode. Where x = 0,1, or 2. AT+ROLE=0 puts the HC-05 in to slave mode. AT+ROLE=1 puts it in to master mode. AT+ROLE=2 puts it in to slave echo mode. In Slave echo mode, the module echos back the data it receives. AT+CMODE? Query the current connection mode. Returns the connection mode value (0,1,2) in the form “+CMOD:0″. 1 = Auto connection on start. 2 = Slave loop mode. AT+CMODE=x Set the connection mode. Where x can be 0,1, or 2. For CMODE to work, the module has to be in master mode (“AT+ROLE=1″). 0 = Manual connection: The remote device address must be specified to make a connection. 1 = Auto connect: Connect to any module/last connected module on start. AT+PSWD? Query the current PIN. Returns a 4 digit decimal number. xxxx = a 4 digit decimal number. AT+PAIR=address,timeout Attempt to PAIR with a remote Bluetooth device. The address must be in the form 1234,56,abcedef (notice the commas). timeout is a decimal value that sets the length of time to try. “AT+PAIR=98d3,32,70facf, 9″ attempts to PAIR with a slave module with the address 98d3:32:70facf for 9 seconds. If pairing is not successful within 9 seconds a”FAIL” error message is given. The SPP has to be initialized before using the AT+PAIR command. This is required by some of the other commands. “AT+INIT” requires pin34 to be HIGH. 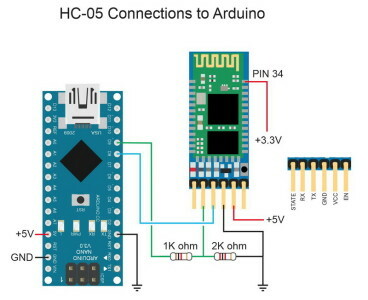 If the HC-05 is in AT command mode but pin34 is not HIGH the module will not reply. If AT+INIT is used and SPP has already been initialized the “ERROR(17)” error message is given. If a command requires SPP and it has not been initialized a “ERROR(16)” error message is given. For a full list of the available commands, download the datasheet. And use “AT+NAME?” again to check the change was successful. “AT+NAME?” only works when pin 34 is HIGH, therefore, if using the button switch you need to press and hold the switch closed while you send the command. After you get a reply you can release the switch. “AT+NAME=newName” works when pin 34 is HIGH or LOW (as long as you are in AT command mode of course). To get the mac address of the HC-05 use “AT+ADDR?”. This is a read only command and you cannot change the mac address. To get the baud rate used for serial commication when in transmission mode use “AT+UART?”. Remember, this sets the baud rate for the transmission mode only. The baud rate for AT command mode is set to 38400. Software serial doesn’t work well at high speeds. The fastest I have good results with is 38400 and this is not 100% guaranteed. If speed is important but not critical try AltSoftSerial. If speed is critical you really need to be using the hardware serial channel. In all the examples I use Software serial or AltSoftSerial to talk to the Bluetooth module. This leaves the hardware serial free so I can use the serial monitor. and to set a new PIN use “AT+PSWD=xxxx” where xxxx is a 4 digit number. Not yet available. In the meantime please see the links below. After trying several suggestions to configure HC-05 through arduiino, I use an USB-TTL to enter AT Mode and change the name for bluetooth. After that I realize that arduino can be configured as USB-TTL. 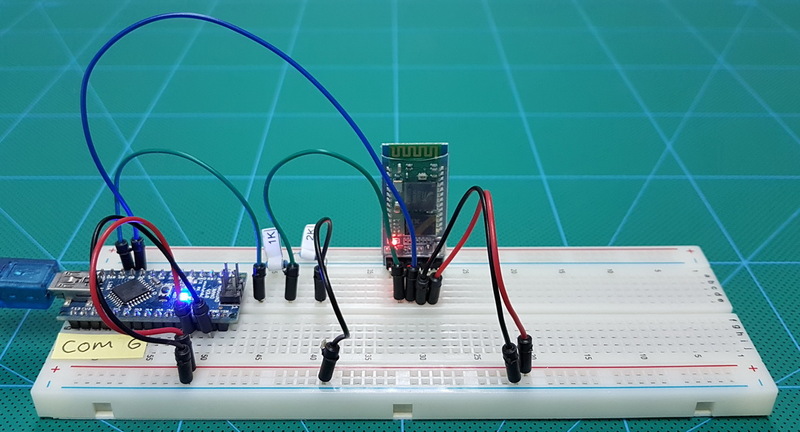 Why suggest to use a sketch when Arduino can work as USB-TTL directly? I try this program in my Bluetooth modual and its works very well but there is one problem when i tried to do the same on my another bluetooth modual with version 3.0 some at commnands doesn’t work link “AT+INIT” , AT+INQ” soo what can i do for this ??? is there any method to change the frimware version of bluetooth modual? Unfortunately I have not come across modules with the newer firmware yet. I have recently purchased 3 sets of modules that were supposed to have the new firmware but all came with version 2. I decided to wait awhile before trying again. You da real MVP! Thanks for this compilation, it helped me a lot! Hi, how to change databits 8 to 7? hi Martyn = this is cool. But I am stuck. I can’t seem to get to what you call “Full At” mode. Specifically trying to get command “AT+INQ” to work but failing. Hey Martyn – never mind,problem solved . (That one anyway). Hooking wire to pin 34 and allowed me to get Command mode and run AT+INQ. Still it was interesting that I could get some more AT Commands (NAME, specifically) by run setting Pin 11 (which I think is Pin34) to high via AT+PIO command . Well now I have HC-05 from three different sellers. Then I ran AT+INQ. And it worked. B After INQ was done, the HC05 was still flashing quickly. But then I ran “AT+RESET” and lashing slowed back to off/on every second or so. one correction/addition to above: while I didn’t run a wire to pin 34 or hold the button – I did put 3.3v to the EN pin on the board (hoping that would raise the internal power to high). Sorry I left that out. An additional ‘bug’ that I overcame. Originally when I ran AT+INQ successfully I would get bad numbers for RSSI (signal strength). The RSSIs would all read “7FFF ” no matter where I moved devices. (I guess some related buffer wasn’t really cleared until you actually set the RSSI parameter to 0).